There were lots of channels and one blockbuster program at RSNA 17. OK, I'm exaggerating a bit—just a bit—but judging by my highly informal accounting, approximately 96% of the vendors I spoke with mentioned that they are using or planning to use AI in some way, shape, or form. By the end of the show, I was surprised if someone didn't bring it up. If that wasn't enough, the sessions relating to AI were packed—one session required two overflow rooms—and there was an entire section of the North Hall dedicated to it, with no fewer than 24 first-time exhibitors showcasing their wares. That doesn't necessarily mean that AI is ready for prime time, but it does show that there is a great deal of demand for it. That being said, AI in radiology is still in its infancy. So, on to the list, for real this time. 1. Workflow. This could probably be on the list every year, and why not? Image volumes grow each year, and it takes several years to grow a fully trained radiologist. The interesting difference between RSNA 2016 and RSNA 2017 was the volume of companies that have developed AI programs to flag suspicious findings and alert radiologists. This is the area where radiology AI is most advanced. In its basic form, company ABC develops a set of algorithms that can identify condition X, Y, or Z. Some can identify multiple conditions. Most focus on a few. Nearly all claim that their algorithm is more accurate than a radiologist. If the algorithm sees something on an image that it interprets as being suspicious, it marks the spot and the study is flagged so the radiologist knows that he or she should take a look. 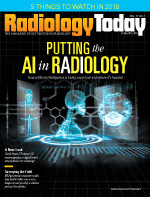 This use of AI is helpful not only for patient care but also for balancing radiologists' worklists, a significant factor in avoiding burnout and maintaining practice harmony. 2. Big data companies partnering with enterprise imaging companies. This trend also has an AI twist. The partnerships provide the data companies access to troves of data, which allows them to improve their AI algorithms. In return, the enterprise imaging companies get access to analytics and AI tools that can help end users manage their data more effectively. Enterprise imaging companies are also taking steps to make data more accessible not only to health care providers but also to patients. Several people I spoke with mentioned patient portal initiatives. As a side note, nearly all of the large equipment manufacturers mentioned that they are developing in-house AI tools. It makes sense, since they already have access to the data and the resources to do the research and build the algorithms. 3. Population health and precision medicine. Although these goals are at opposite ends of the spectrum, they are complementary. The ability to mine data such as imaging data is seen as a necessary step in the quest to develop insights that can be applied to population health, and several companies are applying analytics to better understand their data, in many cases with AI-assisted tools. Some companies are also applying natural language processing to text reports in an effort to standardize those data and make them mineable. On the flip side, more accurate algorithms that can identify imaging features, perform quantitative imaging, find patterns within the data that are difficult to detect, and compare the data with similar cases are seen as a key stepping-stone to individualized precision medicine. AI is also assisting in this capacity. 4. Mixed reality. The most eye-catching trend, by far, was the increased visibility of mixed reality, which is the umbrella term for virtual—completely digital—and augmented—part digital overlaid on real—realities. There were a few companies showcasing mixed reality last year, but there were more this year, and the technology is more developed. Roderic I. Pettigrew, PhD, MD, provided an example of mixed reality's potential in his address at RSNA's opening session, when he played a clip from a multicontinental surgical consultation that was done in real time. RSNA even dedicated a demonstration area to showcase the technology's capabilities. Mixed reality allows the viewer to see inside a patient in 3D—through skin, muscle, and bone, as if the patient were physically present. In some cases, the patient's imaging can be registered with the actual patient, as it was this past summer when the first interventional procedure using mixed reality was performed. When viewing mixed reality in person, the temptation is to think, "This can't be happening," but to borrow a line from State Farm Insurance, "Oh, it's happening, sweetheart!" Several companies are developing the technology for educational purposes, for surgical planning and consultation, and to assist with surgical procedures, and some universities are setting up mixed reality labs to expand its boundaries in surgery and everyday radiology practice. 5. Radiology's value. Although this isn't exactly a new theme, there are signs that the radiology community is taking this question more seriously than ever. From RSNA President Richard L. Ehman, MD's, opening address on the necessity of innovation to several sessions that delved into what innovation—including embracing AI—may look like, the emphasis was clearly on encouraging radiologists to find ways to contribute beyond reading studies. Several presentations looked at ways that radiology can use technology to quantify value. There were also many discussions about the human side of health care, with presenters encouraging radiologists to interact more effectively and more often with referring physicians as well as patients. In his address, "Strategies for Radiology to Thrive in the Value Era," Jonathan B. Kruskal, MD, PhD, said it well: "If we're not there, others will start doing it for us." 3D printing made our list last year, and it very nearly made it again. Advances in materials, sophistication, and postprocessing are helping this technology carve out a strong niche in surgery planning, education, and, in some cases, prosthetics. Also, there were some vendors talking about optimal mammography compression last year, and that talk has only intensified. As more companies focus on women's mammography experiences—including finding ways to encourage more women to get regular mammograms—and more studies come out showing that there is indeed a "just right" amount of compression, expect this topic to gain prominence.